The Devils Lake Water Improvement District (DLWID) has spent a great deal of time over the past three years exploring options that may be useful in addressing long-term water quality issues on Devils Lake. 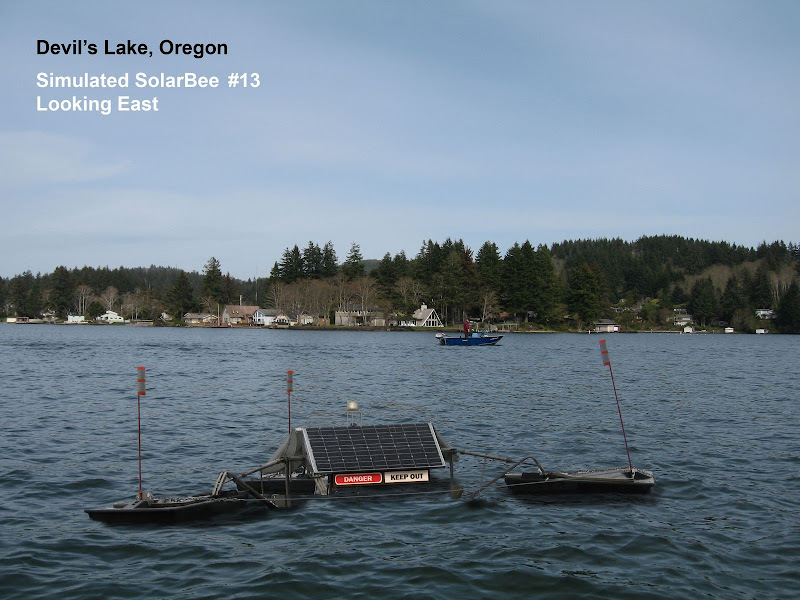 In February 2007 began discussing SolarBees® ; which the manufacture describes as a floating solar-powered long distance lake circulation equipment, with a unique capability to prevent and control cyanbacteria (blue-green algae) blooms. A year later, the DLWID began to formulate serious discussions about the placement of SolarBees® on Devils Lake. In May of 2008 SolarBees® appeared in the first draft of the Devils Lake Plan. In 2008 the District drafted an funding application designed to take advantage the American Recovery and Reinvestment Act of 2009, Their project was sucessfully added to the Clear Water State Revolving Fund (CWSRF) Loan Program, Proposed Intended Use Plan (IUP) – Update #3 dated May 6, 2009. This application for $762,000 is defined as a Sec. 319 Construction project for the installation of SolarBees® to circulate the water in Devils Lake, to eliminate cyanobacteria and invasive weeds. In April 2009, the website http://www.medoraco.com was created in response to efforts by the Devil’s Lake Water Improvement District (DLWID) to reduce summer blue-green algae blooms utilizing twenty SolarBees® water circulators placed down the centerline of the lake. Nosolarbees.com and its supporters opposed to the placement of these devices on Devil’s Lake because it was their opinion that the relatively small amount and short-duration of our annual blue-green algae blooms did not warrant the solution being proposed. The local community and DLWID engaged in a public debate over an 18 month period resulting in a resolution by the DLWID Board of Directors in March 2010, effectively removing the water cirrculators from further consideration. In July 2010 the nosolarbees.com site was replaced with the Devils Lake Navigator which covers a much broader set of topics than it predecessor. Manufacturer Information-Material provided by SolarBees® in support of thier products. SolarBees® Field Experience – Articles the discuss SolarBees® installations around the world. Scientific Study – Peer-reviewed scientific studies on water quality management. Algae Blooms – Lakes that have SolarBees® but have experienced bloom activity. Our position on the performance of SolarBees® is actually neutral. We don’t think that SolarBees® performance is the core issue for Devil’s Lake. The primary issue at Devil’s Lake is the lack of an honest assessment of the impact of blue-green algae on recreational use and a determination of the relationship between the level and duration of our blue-green algae bloom and is influence on the overall health of the Lake and those who use it. The question we need to ask is; Do we have a problem that negatively impacts the lake enough that it requires SolarBees® as a solution? I apologise but, if you’re looking for the answer to the question “Do SolarBees® Work?” you won’t find it here. It’s not relevant on Devil’s Lake. The only point we will make on the performance of SolarBees®, is that they may not meet the manufacturers performance claims if not properly installed in accordance with the engineered design for any given lake. Therefore, the placement of a smaller number of SolarBees® than the original design, would need to be re-engineered for use in a limited trial on our lake. In order to make this point, we present some examples where SolarBees® trials/installations have been discontinued. These posts show excerpts from local news organizations unaltered. Many of these references were posted on another website interested in SolarBees® and the manafacturer provided a respone to each post. In order to provide a complete record, we have included the companies response to each location unaltered. We provide a few links to peer-reviewed scientific studies that discuss different aspects of lake and water quality management including citations from within and a link to the full report allowing for individual review. We also present unedited, material directly from the manufacturers website, including links to their blog. In certain communities the controversy surrounding SolarBees® had nothing to do what-so-ever with their performance. In these communities the issue may have been aesthetics, cost, or a general lack of communication. We feel that our community falls into this category. While this issues has been on the agenda of the Devil’s Lake Water Improvement District for quite some time, most residents are not aware of the projects. We have provided some examples in order for us to avoid making the same mistakes. It it important to note that there are many communities where SolarBees® have been installed and the purchaser is satisfied with the result. The manufacture has made it clear to us that they have many more installations that this is the case than the few we have selected in our articles that this was not the case. The corporate website for SolarBees® is www.solarbees.com and the interested reader can find there many documented cased of these success stories. In summary, our point is not premised on the functionality of SolarBees®, our posts and suggested links have been provided to support what we hope will be a vibrant on-line discussion. Review them and reach your on conclusions.